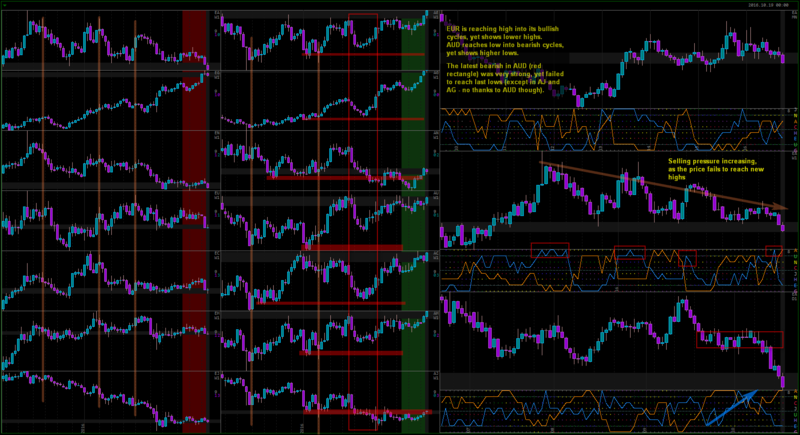 My contrarian tendencies can be a real burden sometimes, as I fail to see potential breakouts 9 times out of 10. Definitely something to work on. Depending on trading timeframe that we use, we will also have different breadth of the market that we can cover. Intraday traders and scalpers generally will not closely monitor more than 1 or 2 instruments, simply because the speed with which they receive information for each instrument is too fast, and they can’t handle many markets. Longer term traders on the other hand are more likely to watch many more instruments on higher timeframes, because if they concentrate on just one, it may be hard to find good entry signals frequently enough. One trading approach is not better than the other, they are simply different. As I mentioned before on this blog, personally my preferred method of trading is watching many markets on higher timeframes and trying to choose the best trading opportunities available. I prefer to trade using scenarios. I build a scenario of how the future may look like and then support it with technical and fundamental information. As the future unfolds, I see if my scenario is being confirmed. If it is, I have a trade. Often times, however, I am trying to anticipate what the market might do based on the current price action. This way I am able to open trades at a much better price then most methods would allow. The price for such great entries is that they will not happen often – when I am trying to catch the top or the bottom, I am fully aware that the market can easily defy my expectations and I will be stopped out. But when the price does go in my direction, the return on such trade is many times greater than the initial risk and getting even 20% of such trades right is enough to offer a very good return on that 5th trade that does work out right. To trade with such method, we have to let the profits run for long term targets. It is not of much use if we accept 5 losses in a row, and then when the market finally moves in our direction, we take 2:1 or even 1:1 profit. In many cases I would only engage in such trades if I see an opportunity to take at least 10:1 profit compared to my initial risk, so that any failed attempts are easily covered by the profitable trade. At the same time you need a lot of confidence to put new trades as long as the market does not defy the general trading scenario. There were times when I would open 2-3 trades, the market would go in my direction (giving as much as 3:1 profit) and I would move the stop in BE, but because I was looking for a much larger move, I would let the market stop me out. Finally, I would lose my confidence to pursue that particular trading idea just before the big move finally happens. You can see how this trade dragged on for 4 weeks, basically giving no return on the risk. Since price has not been breaking the lower support I could not move the trade to breakeven either. As I kept analyzing CAD and JPY currencies, I saw no reason for closing this trade. At no point during these first 4 weeks I could say “I would like to buy this pair here” and so I kept my short. The trade turned out to be the most profitable during the last week, as CADJPY made the strongest weekly move of any other trading pair, but it was not smooth sailing to reach that point. Because I was anticipating what the future techincal picture might look like in CAD and JPY currencies, as well as anticipating the fundamental difficulties for Oil becoming bullish, and overall fundamental market uncertainty, leading to possible appreciation of “safe heaven” currencies such as JPY, I was able to let the trade go. 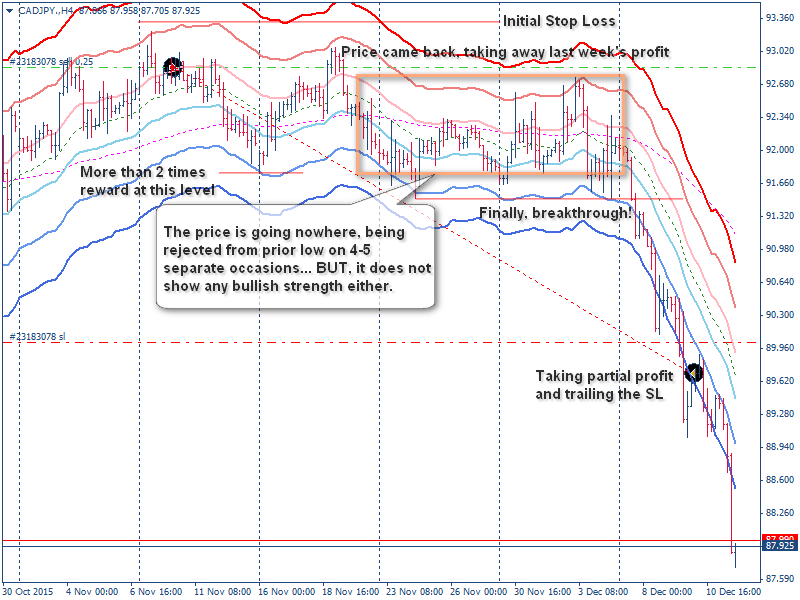 Even though the market was staling, it was not cancelling either my technical nor fundamental scenarios. Such entries require very strong trading psychology, as well as confidence in one’s analysis. One comes from the other, really. You are confident in your analysis not because you are 100% certain that it will work, but vice versa – because you KNOW the market might turn against you and you have accepted such possibility without any emotional discomfort. No matter what market might have done during the time that I was holding my CADJPY short trade, it would not be able to hurt me in any way whatsoever.